A recent article by John C. Dvorak criticize the Creative Commons licenses. When you see its licenses the wording will say something like "Creative Commons License: Public domain." This means that the item is not covered by copyright but is in the public domain. So what's Creative Commons got to do with it? Public domain is public domain. It's not something granted by Creative Commons. Yet you see this over and over as if it were! Dedicator recognizes that, once placed in the public domain, the Work may be freely reproduced, distributed, transmitted, used, modified, built upon, or otherwise exploited by anyone for any purpose, commercial or non-commercial, and in any way, including by methods that have not yet been invented or conceived. You will find a lot of materials published on the Internet claimed as Public Domain but with various restrictions imposed, like "no commercial use" or "give credit". This is not Public Domain. And there is the role of Creative Commons: they precisely define what Public Domain is, what a free-to-copy-but-no-for-commercial-use or a free-to-copy-but-give-credit license is. Another use of Creative Commons system is that your license is machine-readable and this allowed our metadata format and also the existence of various search engines based on the license. SeaMonkey (the former Mozilla Suite) is looking for a new graphic desing/logo. PS: If you don't get the joke, here is a hint. 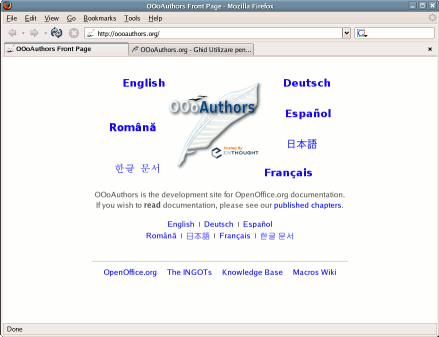 As the front page says: "OOoAuthors is the development site for OpenOffice.org documentation". It received a new graphic style, influenced greatly by Wikipedia. The main purpose was to get a front page which is not English centric and give equal weight to all languages supported. The graphics are made from my drawings, but this is not surprising, as the previous ones were also mine. Inside the site, the Romanian section contain a lot of user guides translated by ghrt (I assumed mostly the reviewer role in this activity). When finished, all tis translated documentation will be available for end users on the Romanian Native Language Project. My activity as an author here is very limited: a couple of drawing tutorials in the English section, and a few edits. 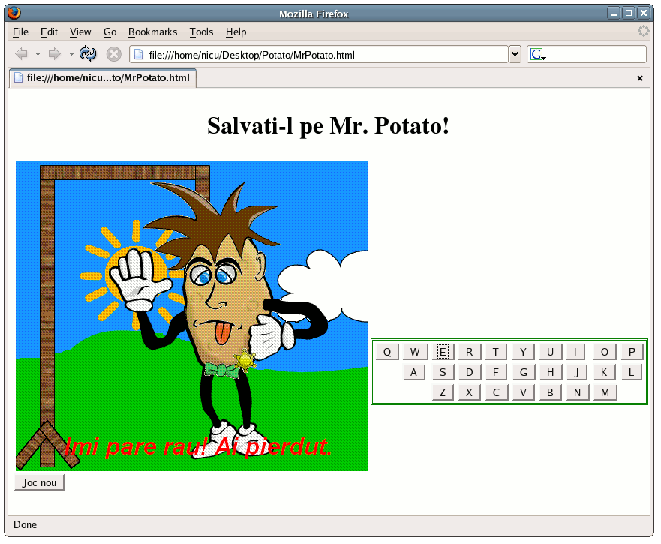 Do you remember my earlier Potato Head generator? Today I found one of my friends, which is a CS student used images from it to make a Hangman game for one exam (Web Programming). I was almost thrilled by this. When I complained the page does not works, the reply was candid "Try it in another browser, I tested it in Internet Explorer and Opera". Sorry, dtinad, no cake for you today! You still have to learn what all this Word Wide Web is about, and program to the standards, not to a specific monopolist browser. And be assured I will not link from my blog to such a broken page. Also today and also about the Potato Head, Alan reminded me about GCompris. Thanks Alan, I remember them, they were one of the first users of my images published on the Open Clip Art Library. But I should witness I am a kind of zealot, if it is not a GNOME program probably I will not use it, so is not a very attractive target for me. Holly Crap! My eyes! It burns! Be warned and do NOT click on it.